The big news is that Grace “graduated” fifth grade – she moves into the middle school program at her school in August. We had the typical May-early June crush of school stuff. Now we’re transitioning into summer- she’s got a few weeks of art camp lined up plus three weeks of sailing camp. Right now we’re just enjoying having her around during the day, and enjoying the fact that there’s no early bedtimes. As for Grace, she’s enjoying being able to sleep in every day (Grace is one of those kids who would sleep until 2pm if we let her- she’s always been that way) but she is not enjoying being away from her friends every day. Thank goodness for technology. Now we just have to figure out the time limits. I cannot believe it’s already the middle of June. What?! This year is flying by. If you have been reading this blog/journal for a while and/or if you know me at all, you know that summer is *not* my favorite season, weather-wise. We live on a little island off the Southwest coast of Florida – so summers are brutally hot, humid, and very stormy. I like to spend time outside, so I get cranky when the weather prevents me from doing that. And I also get in a funk when there’s not much sunshine. So far, the weather has been more stormy than usual thanks to some storm front that developed in the Gulf of Mexico in late May. 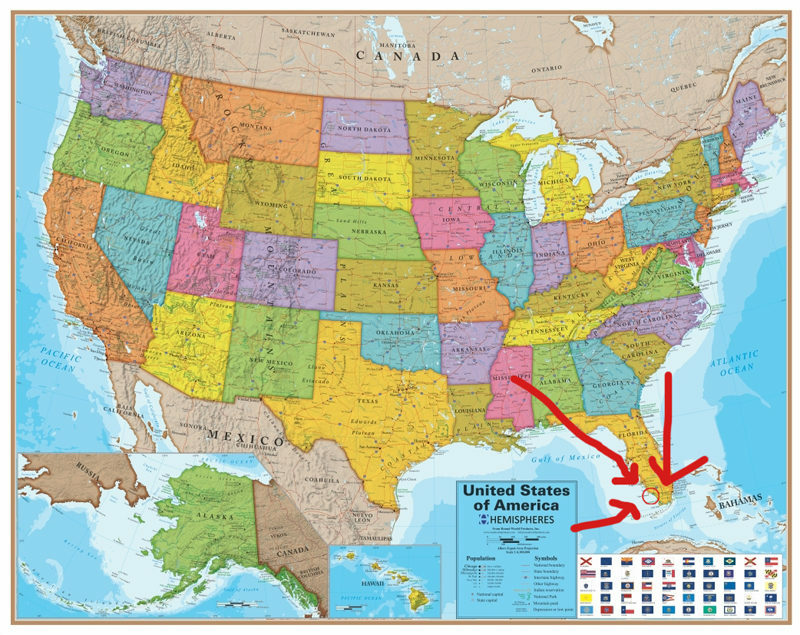 The red circle on the map is where we live. Way down South. What’s new this year is a tremendous mosquito infestation. Because we’re a tourist destination, pest control is sort of crazy down here (people like paradise, but they don’t like the bugs and rodents that come with it.) And they’ve done such a *good* job at pest control that they managed to kill off all the things that eat mosquitos, as well. The plus side to the bad weather and mosquitos is that the island emptied out a few weeks ago- all the snowbirds and tourists disappeared in late May. Despite the weather and bugs and chemicals, I think I actually enjoy summer more than I do spring, which is a little blasphemous because in early spring, the weather is beautiful. But in spring the island is packed with people and it feels like the island is one giant swarm of activity and frenetic energy. It’s always a relief when we (the handful of people who live here year-round) get the island “back” at the end of season. I read somewhere there’s an 80% population drop during summer, which seems accurate. I know summer tourism is way down this year because of the mosquito issue. Right now, it’s like the island is an entirely different place than it was just six weeks ago. I love love love love how quiet it is right now. It’s like the island is asleep- it’s very peaceful and chilled out. Very few cars on the road or people around and half the houses around us are boarded up for summer. When I meditate outside every afternoon I can literally hear across the entire island. It’s almost as if I’m hearing the island, itself. I can hear the palm trees rustling in the breeze, the water lapping in the bay (on some days I can hear the Gulf of Mexico from our backyard), and listen to the birds calling to each other from all over the island. It’s really lovely to sit out there and shut my eyes and just spend some time *listening* to everything around me, even if it’s just for ten minutes or so. Speaking of meditation… yes, I’m still doing it. I’m up to about 40 minutes a day now. About eight weeks ago I started my online studies at Sravasti Abbey and the program is WONDERFUL. It’s exactly what I needed, in terms of both learning about Buddhism and putting it all into practice. There’s a significant amount of reading and online teachings to complete each week, as well as a good deal of writing and reflection due every week. There’s a class facilitator who reads over our stuff and gives us feedback and answers any questions we have on the material or meditation. I’m really glad I chose the program at Sravasti. Back in January I was positive that I was going to be studying Buddhism academically, but the more I learned about it, the more I realized I wanted to do more than just memorize the history. Sravasti’s program is as much about practice as it is about information. I’ve been working a lot on two particular issues in my own life: attachment and expectation. I’ve always known about the problems both of those issues can cause (attachment causes us to kind of dig in to the past, as well as try and plan for the future, and expectation is basically us setting ourselves up for disappointment. I mean, what goes exactly according to plan in life? Not a single thing) but the stuff we’re doing in the class made me realize what a HUGE influence both attachment and expectation have had on my life. Just becoming more aware of both those things has created tremendous changes for me. The other big “wow” life-changer has been meditation. The meditation that Sravasti teaches is slightly different than the meditation I was familiar with- it’s not just about sitting quietly and trying to keep your mind still, it’s also about contemplation. There’s still quite a bit of “observing” your thoughts, but you’re allowed to engage with your mind and not just have to sit there and try and get yourself to stop thinking. It’s funny, because I wrote all those posts a few months ago about my meditation experiences and now I look at them all and realize that what was happening was me basically fighting my mind as hard as possible. I can see it now, but back then I felt like I was making progress. It took weeks before I wore myself out an decided to just let my mind go crazy while I was meditating. And that’s when I finally relaxed enough to let meditation actually happen. But there’s no way around that- if you have a busy mind, those first few months of meditation will be rough. You just have to keep coming back and then one day you get tired of fighting and let the thoughts flow and *then* you start meditating. The thing is that meditation is basically a lot of trying- trying to distract yourself from your thoughts with your breath or a sound (or whatever works for you). You can’t completely disconnect yourself from your thoughts or turn them off. So you just try and direct your attention to something else. When your mind pops up with something (which it always will, over and over) you acknowledge it, and then go back to trying to focus on the breath/sound. Oddly enough, it’s all that trying that changes the way your brain works. Every time you pick up on the fact that you are thinking, you are training yourself to create a tiny little pause between thinking something and acting on it. You are training yourself to get better at recognizing thoughts and impulses as they come up. If you can catch them before they evolve into a feeling or action, you can evaluate them and decide whether they are worth acting on before anything happens. Evolution-wise, humans are designed to take EVERYTHING personally, and evaluate everything as a threat, and if necessary, take action. So the world becomes scary and you’re constantly on patrol for bad things. If you’re someone like me, who has a lot of anxiety, this is exhausting. The little pause from meditation is literally just microsecond after something happens that you can pull your mind back from assuming the worst and see things for what they really are. So in a way, that pause gives you back your life because your assumptions aren’t running the show. And all the good benefits people attribute to meditation? Happiness, well-being, relaxation, better relationships with people, less reactivity? They come down to that tiny pause. I wish I could explain it better, but I can’t. Honestly, while you are doing it, meditation can feels like a total waste of time, but when you see the effect it has when you’re not meditating, it becomes a priority. Don’t get me wrong, it’s not like I’m suddenly Miss Merry Sunshine. I’m still easily irritated and exhausted and often distracted and I still have issues with self-doubt, etc. I’m still waking up every day wanting 10 more hours of sleep. Politics still make me crazy (although not nearly as much- I’m working hard on trying to cultivate compassion.) But I feel like I’m finally getting a foothold on the psychology mountain of Chel, and I’m starting the climb. It’s kind of a big deal when you realize you have a little more control over your life than you previously believed. At least it is for me. ANYWAY, my class at Sravasti is actually why I am writing again. As of this week, part of our regular daily practice is to take a little quiet time every day (in addition to meditation) to reflect and review and work things out, if necessary. Just a way to clear our mind and get ready for the next day. One of my classmates mentioned that she was going to do this in her journal, and I was, like, “oh, what a good idea!” because I thought that the ritual of sitting down and writing a little bit every night after dinner would be a great opportunity for mindfulness and contemplative practice, and also a good way to end the day. Then I thought about finding a place to do it online, and I realized – DUH- I already have an online journal. The thing is, I likely will not be posting everything I write. I no longer feel the need to share as much as I used to. I truly think it’s because of the expectation thing- as I work on it, it’s getting easier for me to just do things without attaching an expectation to how they will be received or how they will turn out. I’m not fully there yet, but it’s coming along. I guess that will be one of the things I talk about. Who knows, It’s likely going to be random, which kind of makes me happy, because this agonizing and editing entries over a span of days is not my idea of a great time. I’d rather just write something and push “post” and leave it be, as unedited and random as it may be. *shrugs* Oh, well, whatever. I’ve been writing in this thing for TWENTY YEARS (!!!!!! I started in 1997, my first year of grad school. Holy crap!) and I’m still here, even though it’s fairly irregular. But still. I reserve the right to take breaks as often as necessary to attend to life. And to be a random writer and crummy editor. Anyway, now I am going to end this abruptly and go to bed. Hope you are happy, safe, and well. Next Post … just, no.